Between a week of vacation and a week and a half of being sick, I've let a lot of good habits slide in the last month, among them blogging. However, since I've spent the majority of the last two weeks in bed or camped out in front of the TV so there hasn't been lot to blog about to begin with. Trust me, you haven't missed much. 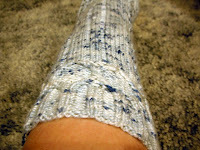 In addition to the reading, I managed to finally finish the second sock of the pair I've had on the needles since March. That was an Event, since it started with a massive kitchner fail on the toe and ended with me realizing there was a rather massive error in the pattern that resulted in a-symmetrical socks. They fit fine, they just don't match. So once my fragile knitting ego has recovered, I'll have to rework them. At the moment, however, I can't fathom the idea of knitting those socks again. It's not that I dislike the pattern, it just took so long to work out the cables around the cuff and there was a lot of ripping back. Either way, it will have to wait about two weeks since I've got some deadline knitting on the needles right now. I need to finish a baby sweater for a coworker before A) she goes on leave; B) she goes into labor; or C) I leave for my new job. That's right, I'll be starting a new job later this month. Same company, different location, different position. And since I like to keep my work life as separate from my online presence as possible, that's all I'm going to say on the matter. If I fall off the blogosphere again, someone poke me. Why is it that good habits are so hard to start and bad habits are so hard to break? If you're part of C.E. Murphy's latest crowdfunding project, she's also released three of the promised short stories thus far as well as a novella called Right Angles to Fairyland. Thus far, these are only available to her crowdfunding sponsors, but cross your fingers that they're released mass market soon!